Airborne Wind Energy, also known as “High Altitude Wind Energy”, is a new and developing form of renewable energy technology that uses airborne devices to generate power. Unlike conventional wind power which uses tall wind turbines affixed to the ground or far out at sea, airborne wind energy uses free floating devices such as balloons, kites and tethered wings suspended high up in the air. Airborne wind energy uses many well established technologies currently being used in conventional ground based wind energy turbines, such as using the same types of generators, gearboxes, and grid-tied power converters. What makes airborne wind turbines different from their land or ocean based cousins is the way in which they extract the energy from the wind. Instead of a large steel tower structure, a tether cable anchors the system to the ground and instead of long rotating turbine blades, specially designed aerofoil kites and wings sweep a path across the sky to extract the winds energy. We have seen as children that when flying a kite there is a lot of pulling power from the wind, and this is also put to good effect by those people using airborne kite boards and kite buggies as a form of propulsion. But we can also use the same pulling power and lifting forces of the wind to generate a cheap and abundant supply of electrical power using airborne wind turbines. Airborne wind energy devices such as a tethered wing or an aerofoil kite are electro-mechanical systems that extract the power from the kinetic energy of the winds circulating around in the sky. Most airborne wind power devices are designed to fly in a crosswind or transverse direction allowing them to concentrate the winds immense wind power resource at medium to high altitudes of more than 200 metres. This is because at altitudes above 200 metres the winds speed is generally higher and more consistent than nearer to the Earth’s surface so we can use these high winds as an energy source and generate power using it. Also, the lift and forces produced by the wind at these altitudes is sufficient to both support the airborne device and generate power. Since these airborne wind devices operate at a greater altitude with stronger wind speeds more electricity can potentially be generated with a greater consistency. Due to these high altitudes conventional wind turbine towers even as high as 100 meters can not be used, however locating wind turbines high up on the tops of mountain ranges does offer a significant increase in power conversion compared to those located lower down at sea level. Airborne wind energy devices are mechanically connected or tethered to the ground in order to exploit the relative velocity between the movement of the wind and the stationary ground. For capturing the winds power from the high altitude winds different devices based on aircraft technologies have been developed such as: aerofoil kites, sky-sails, gliders and sail-planes both with wind turbines attached to bring power as well as the forces down to the earth. Theses devices can be connected to either a stationary ground station to produce electricity, or to another moving, but non-flying object to produce a traction power, such as the rotation of a flywheel. We are all familiar with the spinning blades of ground based turbines. So how do airborne wind energy turbines generate power?. The most common method used currently is a ground based generator attached to the tether cable winch which produces power as the kite or aerofoil pulls out the cable. The torque and velocity of the tether cable produces electricity by rotating the winch drum which in turn drives an electrical generator. In a ground based generator systems, electrical power is produced as the tether cable is pulled or reeled out until the maximum tether length or altitude is reached. The next stage involves the recovery or retraction of the tether cable which is wound back onto the drum. The winching in of the tether cable uses a small amount of electrical power, as the generator becomes a motor drive to retract the cable. Once the tether cable is full wound back onto the drum the generation process begins again. Due to the periodic reel-in and reel-out motion of the airborne device, ground-based wind power generators are sometimes called Yo-Yo generators. As the electrical generator and winching mechanisms of these ground based wind energy systems are located on the ground, lightweight flexible wings, surf kites and aerofoils can be used to sweep a path across the sky to extract the energy. But we can also use airborne based generators which use rigid wings that resemble a fast flying tethered aeroplane or the tips of wind turbine blades to generate electrical energy. Airborne generator systems are typically more like an aircraft and less like a kite, featuring on-board computerized autopilot systems and flight controls. Instead of having engines and propellers, these plane like devices have turbines and on-board generators that generate the electrical power as it glides in the wind. The disadvantage of these airborne wind energy devices is that the tether has to both conduct electricity and withstand the strong pulling tensions of the wind. Also the increase in the tethers diameter increases its drag and the on-board generators and power converters add extra weight to the airborne system. Other types of airborne wind power systems include helium filled balloons and Zeppelin type airships which are lighter than air and generate power using large horizontal Savonius type rotor. Some airborne wind energy systems do not generate any electrical power, but use the strong pulling force of the wind to drive a some form of vehicle on the ground around a track. Wind energy is one of the most advanced technologies nowadays for renewable energy sources. In the areas where energy production capacity is needed the most the available land space is limited and has lead to a strong focus on offshore technology for the future investments. Airborne Wind Energy is one of the options that could be used especially in the offshore wind market when the technology becomes more mature and viable for the commercial application. Offshore wind energy also offers greater energy potential as wind speeds are higher out in the oceans. Bad weather in the form of thunder and lightning strikes pose very serious risk to the destruction of any airborne device. No power is generated if the device is retracted during bad weather. Safety hazard as the airborne devices and power cables may become detached or damaged falling to the ground. 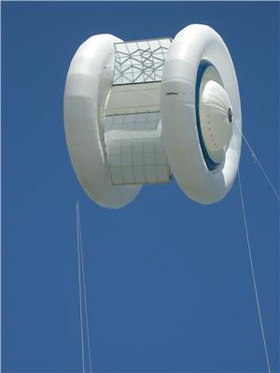 Public acceptance of these large floating airborne devices over land and residential areas. Design and control challenges of these autonomous systems in all wind and weather conditions. Kites and wings must be light and durable to fly in the high altitude winds. Electrical energy losses in the long conducting cable from the airborne generating system to the ground. Tether drag due to large diameter tethers that must survive many duty cycles of varying load, for ground-based systems. The success and on-going development of renewable energy resources including wind energy will benefit greatly from advances in new technologies, ideas and the control systems being introduced getting more mature as they evolve. Airborne wind energy is a relatively young technology and industry but the ideas and concepts already developed seem to have a promising potential playing a vital role in the renewable energy sector. maybe one day there will be many airborne kites, balloons and wings flying in the skies generating electricity from a free and sustainable high altitude wind energy. To learn more about “Airborne Wind Energy”, (AWE) or obtain more wind energy information about the various wind turbine generating systems available, or to explore the advantages and disadvantages of wind energy, then Click Here today to get your own copy of one of the top “Airborne Wind Energy” technology books direct from Amazon. These airbone kites can generate much electricity and can be a problem for birds and planes.